Noah, my training takes too long. I&apos;m bored with my split and I&apos;m not sure I&apos;m even getting the best results I could be. Got any ideas? The muscle-building mantra: To build it, you have to do a high-volume, seven-day split that begins with Monday, International Chest Day. This might come as a shock, so you may want to sit down: You&apos;re being lied to. Do you truly believe your muscles know what day of the week it is, or that it would matter if they did? A program needs to be set up by principles of growth and rest, not because there are seven days in a week. Stop worrying about doing chest on Monday, back on Tuesday, shoulders on Wednesday, and legs on Friday. I&apos;m about to show you why that&apos;s all nonsense. I strongly believe in training frequency over volume. My beliefs are backed by science. First, muscular hypertrophy ceases at the cellular level 48 hours post-trauma, (i.e. post destruction from a killer workout). If you&apos;re doing the typically misguided bodybuilder routine, you hit any given muscle group once per week. That means if you train chest on Monday, it doesn&apos;t get worked again for six days. That&apos;s just too much rest. Just a few days after you crush your chest, it&apos;s ready for another bout. Worried about overtraining? Ask yourself this: Has an athlete ever become great from practicing something once per week? Second, Pareto&apos;s Principle, or the 80/20 Rule, states that 80 percent of your results are from the key 20 percent of your work. In reference to growing and training our muscles, Pareto&apos;s Principle implies that 80 percent of what you do at the gym is not giving you optimal results. Even so, I like to err on the side of caution and do accessory movements and intricate detail work. The bulk of my growth is centered on the essential movements and doing them with all-out effort. Third and most important principle of growth is called reciprocal innervation. Reciprocal innervation is a reaction by your central nervous system that essentially shuts down the stimuli to the antagonist muscle you are working. You can understand this by performing a leg extension: your quad fires like crazy but your hamstrings are relaxed so they don&apos;t resist the quadriceps contraction. You can use reciprocal innervation to your advantage. Instead of training synergist muscles—like chest and triceps—on the same day, train antagonist muscles. While you work your chest, your back gets a break. There&apos;s no need for rest periods if you alternate antagonist muscle groups because the rest periods are already built in! 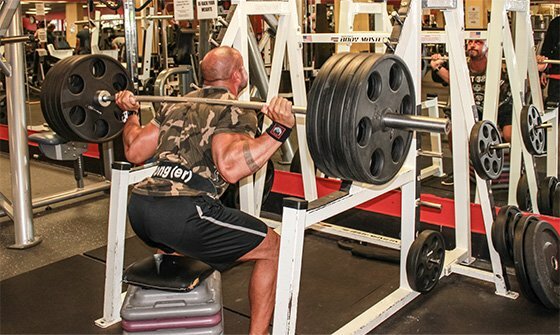 For years I read the muscle mags and tried to copy the four-hour push or pull workouts the mass monsters were doing. I did sets of endless volume with huge rest periods between exercises. Why? I spent so much time and energy on misguided focus. Sound familiar? If it does, you&apos;re just wasting time at the gym sitting around doing nothing but resting. You&apos;re there too long, your secondary muscle group is already tired by the time you get to it, and your energy is gone. Wouldn&apos;t you be able to work your triceps heavier and harder—and thus make them stronger—if you didn&apos;t do chest first? 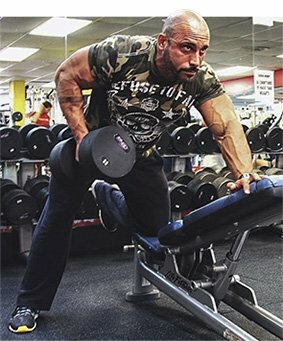 Do you think it would be more efficient to do fewer sets of triceps work, but hit them heavier, harder, and faster? "I don&apos;t have to sit for two minutes between exercises in order to rest my chest. My chest gets a break when I move to a back exercise." The basis of my entire training is doing antagonist muscle groups on the same day. Like I said, I use reciprocal innervation to get a lot of work done in one day. I don&apos;t have to sit for two minutes between exercises in order to rest my chest. My chest gets a break when I move to a back exercise. By the time I&apos;m done with my back movement, my chest is ready to go again. This type of training allows me to keep the pace moving, keep my heart rate up, and keep my intensity high. I also get done quickly; my routines never go longer than an hour. Even better, my constantly elevated heart rate means I don&apos;t have to do traditional cardio. Not even once per week! I prepare my split as follows—you will notice that I base it on prescribed rest and recovery, not days of the week. This means that you may not get to hit chest on Monday with all the cool kids, but I think the gains will be worth it! I work two antagonist muscles and then hit them again a few days later. You may choose to move your rest days around depending on your personal abilities. You may also need to re-arrange your split to increase the frequency of body parts that need more work. There is no single absolute correct way to do things; everyone is unique. Organize your workout so you alternate exercises between muscle groups. Do sets of a back exercise and then couple it with a chest exercise. Continue going back and forth between chest and back movements. Keep the intensity high and the volume low. Make your sets count. Toss out that ineffective 80 percent and replace it with efficiency. Every workout you do will have focus and drive. You&apos;ll get better work done faster. Check out my other training articles, if you haven&apos;t yet!